Been waiting for these to come on sale again, and although they are a slightly different design, they look similar. Don`t dismiss these, I bought a pair a few years ago, and they are still going strong, better than boots costing £££`s more. Cold voting boot snobs out already I see, comment at least before voting cold. I dont know anything about this hiking boots and I am not going to buy them either because I dont need them. I wonder why this is voted cold. If there is a reason like a bad brand/horrible product, you guys have to enlighten people like me before voting cold. Just because of this, I am voting hot. Nothing say awful like Lidl's footwear!!! Sorry but my pride won't let me vote anything but cold. Nothing say awful like Lidl's footwear!!! Sorry but my pride won't let … Nothing say awful like Lidl's footwear!!! Sorry but my pride won't let me vote anything but cold. Lidl says these are £14.99* Per Pair. Always better to buy two. I use these a lot on coastal path walks. 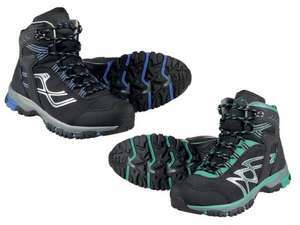 Find them better than mountain warehouse or karrimor boots costing 2,3 and 4 times as much. Make sure you use them with some decent insoles (lidls crivit ones are good for this). They last for a good while and are waterproof.. What more do you want for £15? I have a pair of these and they are THE comfiest walking boots I've ever owned! I wear them every day for long walks with the dog and they are showing no signs of any water and tear! Nothing wrong with these boots at all. Every day use for dog walking and they are really comfy. What more do you want.